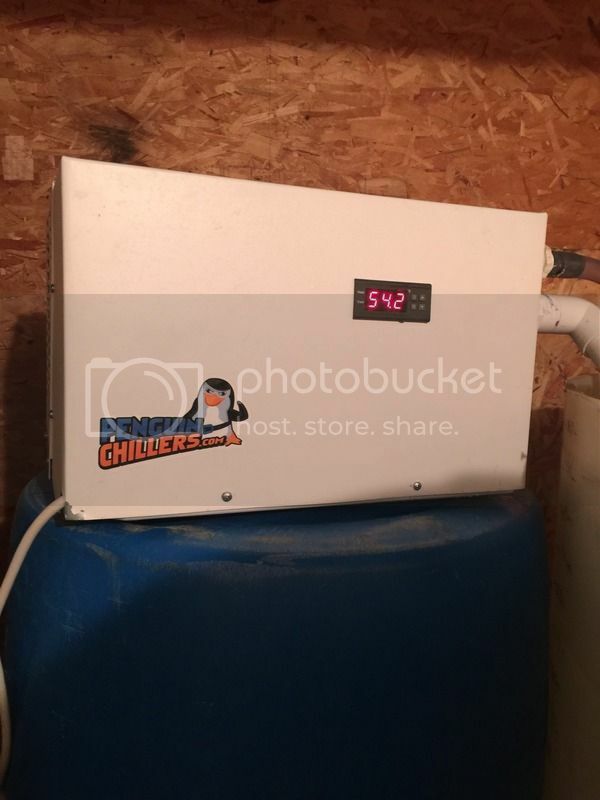 Love this chiller made in Florida and under $500.00. 1/2 hp. Bought it new on Ebay from the manufacturer. No choice but to keep adding ammonia and nitrite reducer (Amquel and a similar product) and do daily water changes before adding the product. It now appears my biofilter is doing a mini cycle for some reason. It probably doesn't help the well water I use for make up water although crystal clear and iron free has a Ph of 7.4 vs. the system water of 8.4. As soon as I can order a repair part for one of my extra pumps I will hook up vigorous aeration in the make up water storage tanks to get the Ph the same as the system water. What was the temperature of the system the biofilter was on previously? Even if it was ambient/room temp, asking the nitrifying bacteria to do the same job at 54.2F (as per your pic in the previous post) is more than they can handle right away. Chances are you lost a good portion of them in the new system at the lower temp and you are indeed having to 're-cycle' your filter. It'll catch up and it sounds like you're doing the right thing to make sure your fish are ok. I would age well water in tank with lots of oyster shell and possibly have some oyster shell in filtration for culture system. It takes a week or two for biofilter to adapt to lower temperature but bigger issue is biofilter as a general rule needs to be larger when operating at low temperature. When I run Rainbow Trout in an RAS, makeup water flow is kept relatively high anyway in part to reduce those big changes in pH but also keep bacteria titer down. High bacteria means messed up skin and fins. I believe you are spot on! Just hope it doesn't take too long! Why oyster shell? Water is high in calcium, hardness, and alkalinity and all it takes is aeration to bring up the Ph, which kills two birds with one stone by blowing off nitrogen gas along with the C02. I have been dong 50 percent water changes per day along with the ammonia, nitrite, and nitrate reducer. My biofilter is 4 cubic feet for a couple thousand fry. I will be adding another 4 cubic feet soon. More surface area and additional buffer to water quality changes, especially as you de-gas. The oyster shell can also provide physical substrate for bacteria that help reduce toxins in a more aerobic environment. Makes sense. I do want to add another moving bed bioreactor in line with my present one and add another 4 cubic feet of media. Tell me more about this "bacteria titer?" Can you elaborate? When bacteria concentrations in the water get high, it sets stages for the bacteria to more frequently assault the trouts exposed tissues whether damaged or not. The bacteria I am most concerned about are facultatively pathogenic, otherwise living on the organic mataerials in the system. .When you visit my trout farmers, you can readily see that as your go down stream in the facility, the fish look rougher even though water quality is maintained with respect to nitrogenous compounds. I have same problems in RAS's holding just about everything. To keep everyone in top form, either an inline anti-microbe system (UV sterilizer) or high rates of makeup water needed to keep free swimming bacteria under control. You want your fish pretty if skins and fins to be used on mounts. I'm going to so something as an experiment. I have a cheap Intex cartridge filter and pump laying around that came with an Intex pool I use for a holding tank when I seine the ponds. I've never used the filter. Going to plumb it into the top of the Sand and Gravel filter. The water is already really clean just before it goes into the fish tank (looks swimming pool clear) so it shouldn't overload the cartridge filter. I can get the filters cheaply at the local hardware store. Or maybe the sump tank before the water goes up through the sand and gravel filter? I would use such to polish water rather than be where you have any dissolved organics or reduced inorganics that will feed bacteria growing in the filter cartridge. So best to use after the S & G before entering the tank? S & G is essentially a polisher. My ammonia and nitrites were zip this morning. You know you're a fish geek when you tell people you're excited the ammonia and nitrites are zero like it's Christmas and they look at you like, "You need to get a life." Ammonia and nitrites are up again. I'm beginning to think I definitely need more surface area for the bacteria, so hopefully will get the media next week and set up a second biofilter in tandem. 4 more cubic feet. With up to 8 feedings of high protein fry powder per day, albeit small amounts and the cold water, I must be taxing the biofilter. I'm hoping 8 cubic feet of media is enough until I plant them into the pond in the spring. I think you have plenty of filtration/surface area. I am thinking that that the nitrobacter aren't able to reproduce quickly enough for our liking when setting up a new system,....especially in a cold water system. There is obviously enough nutrients for them, but we can only pray to the fish gods that our tanks cycle faster. Thanks for the comments littlen. I just added the second biofitler anyway and it was a challenge. Can't hurt I suppose. Put in a cubic foot and will be adding more day by day as it becomes a little less buoyant. For the night I don't have the parabolic filter hooked up as I had to glue some pvc together to extend routing to accommodate the second biofilte drum. My concern was the fresh PVC glue on the fry. Those fumes are wicked! Do you have any pictures of your system including filtration? I'm just curious to see what it all looks like, I'm always intrigued by different filtration methods. Also - I may have missed this in a previous post so my apologies if I did, but what are you using as your bio media? I'll take come pics when I have time. Not sure if I posted any or not. I have moved the fry out of the baskets and they are now free swimming in the fish tank. I have more and more coming up into the water column, but initially a substantial amount wanted to stay on the bottom. Water is cleared even more by using the next size up feed which doesn't dissolve as readily in the water as the fry powder did. I do wish my tank was shallower but it is what it is. It's a 28 inch climb from the bottom of the cone shaped tank to the water's surface. if and when I do this again I will make some changes as in the tank tank etc. Will use a flat bottom tank in the future and plumb it shallower. I can attest as literature says there really is no advantage to a cone shaped tank except for draining. The solids still sit on the slope.